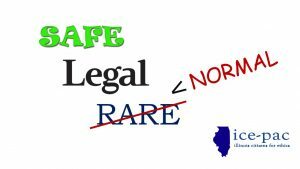 As promised by the abortion lobby of Illinois, radical pro-abortion state representatives and state senators are working hard to “normalize” abortion in Illinois. House Bill 2467/Senate Bill 1594 and House Bill 2495/Senate Bill 1492 were introduced in the Illinois General Assembly on February 2019. ICE-PAC opposes these bills and warns every legislator who supports them that there will be political consequences. HB2495 Reproductive Health Act (the same name of the radical pro-abortion bill signed into law by Andrew Cuomo of New York), was introduced by Rep. Kelly Cassidy (D), Rep. Chris Welch (D), and Rep. Sara Feigenholtz (D). This bill repeals the Illinois Abortion Law of 1975 and the Partial-Birth Abortion Ban Act. Repeals the Illinois Partial Birth Abortion Ban Act! Yes, Repeals 100%! Allows abortion up to the moment of birth, for any reason, or no reason. Declares that the unborn child has no rights under the law. Eliminates any restrictions on where abortions may be performed. Requires private insurance plans to cover abortions at no charge to the patient! None! Not even a co-pay! No exception for churches, religious non-profits, or pro-life small businesses. Plus, No exception for self-insured plans and no exemptions based on any rights of conscience. None! Repeals the Abortion Performance Refusal Act, which removes protection for nurses, doctors, and hospitals against professional repercussions for refusing to participate in abortions. Even faith-based hospitals aren’t protected. Lifts the ban on sale of an experimentation on a fetus and the requirements to obtain consent of a pregnant woman before experimenting on the organ and tissue of her aborted baby. The legislation paves the way for public funding of abortion to the moment of birth, even for elective abortions. Removes the requirement that a medical doctor must do the abortion, or even be present. It allows anyone supervised by someone permitted by law to administer healthcare, within the scope of training and practice!! Removes coroner powers with respect to maternal or fetal death due to abortion. Removes ‘abortion’ from fetal death statute. Removes penalties for performing an abortion on a woman who is not pregnant. Prohibits legal action against mother of an unborn child for drug use during pregnancy. Removes the statute requiring physician’s prescription before getting the abortion pills. Strips the unborn child of any independent rights under the law. Eliminates requirements to report annual abortion numbers to the public; in other words no one will know how many abortions are performed or how many out-of-state minors have traveled for their abortion in Illinois. HB2467 Parental Notice Abortion-Repeal, introduced by Rep. Chris Welch (D). This bill repeals the Parental Notice of Abortion Act of 1995. Makes corresponding changes in the Counties Code, the Medical Practice Act of 1987, and the Consent by Minors to Medical Procedures Act. So, get this: A 15 year old girl needs parental permission to get an aspirin at school, get an ear pierced, see an R rated movie, and get a tattoo….but that same girl can walk into any abortion clinic and end the life of her baby………… without a parent even required to know! Even without these outside pressures from society, no girl should be making decisions regarding the killing of an unborn baby without a parent involved. You don’t have to be anti-abortion to understand this. The bills are expected to pass the democrat super-majority led house and senate, unless there is an outpouring of public outrage. So, it goes without saying that you must take action. Contact your elected officials now.